Now, I'm the first to admit that turning is something of a new experience for me. 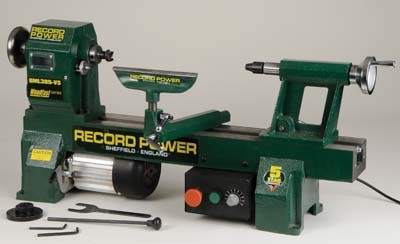 So, I'm probably not the best qualified to review Record's midi lathe. 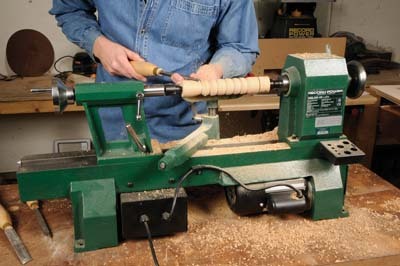 On the other hand, as this is the sort of lathe that someone who is just getting into turning may well purchase, you could argue that I am perfectly suited. So, optimist that I am, and with this latter point in mind, I set up the DML305-VS.
As Alan Holtham assured me while I was watching him demonstrate at the recent D&M show, vibration is the enemy of the turner. And for a midi lathe, you are on safe ground here, with Record's finely ground cast bed. When you get this fellow bolted to your desktop, it's very solid. The lathe comes with a four-prong drive centre, and a live tailstock centre. The tool rest operates with a cam lock and is easy to operate. The motor for this lathe is three phase, it uses a high quality German Schneider invertor to convert the single phase supply to three phase, which gives stepless control with the electronic speed control system. The bed of the lathe can also be extended with a cast iron insert and the whole thing, including the table extension, comes with a stand so you can floor-mount it all. For the purposes of the test, I turned random shapes onto an oak blank. The variable speed motor had great control when moving from roughing to finer cutting. All in all a pleasure to use. This is a high quality product at the pricier end of the market. It has all the features anyone starting out in turning, or an accomplished turner who needs a transportable lathe, would need.